Since 2006, the Internet's Premier Source for Combined Knitting and Phillies Information! With slightly chillier weather in store, I promised Gus I would make him a pair of Pop-Up Paws (fingerless gloves with a mitten top flap). This allowed me to make a tiny dent in the mountain of my beloved 1824 Wool that lives in the basement. Please note these were made with a thumb-flap, which is all the rage these days amongst the young folks for texting. Gus does not text, but he will receive admiring glances from the Upper Schoolers. 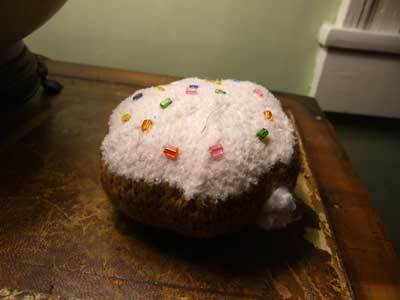 It was a close thing - I was furiously knitting fingers at basketball practice last night - but I finished! 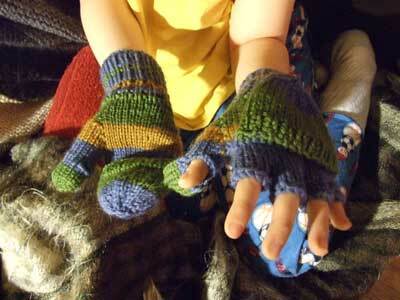 And was able to send him off into the COLD world this morning with proper mittens. It's a cream-filled donut. I made it for Matthew, who loves donuts, but there is donut love on my side of the family as well (Dad) (and Gus)(oh all right, and me), so it could have been given to many people. Matthew was a little bemused as to what it actually does. Which is nothing. Except make me laugh. Selbu Modern Beret by Kate Gagnon. Truly beautiful pattern. I made it out of Rowan 4-Ply Soft, which is dreamy to work with. 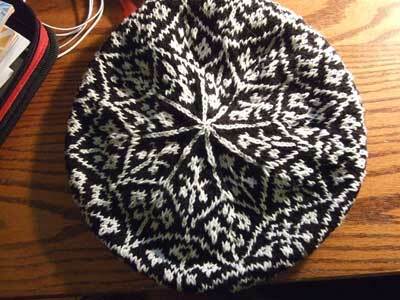 This was to go with my single Selbuvotter glove, but after I finished it I tried it on and it looked goofy. It still needs to be blocked, but I don't have high hopes for it. It's a pretty beautiful object though. He turned out cute, but this was my least favorite knit. 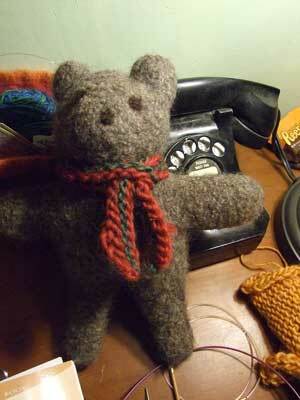 The other FT animals end up knit in one piece, but this guy was knit in a front and a back and then sewed together. No thanks. In case I get blog-slacky and don't post in the next few days, Go Eagles!! The cream-fille donut is hilarious and, am I correct, bejeweled? Excellent. I also like the colors of the gloves. CG - it is not bejeweled. It is be-sprinkled...or more correctly, be-jimmied.